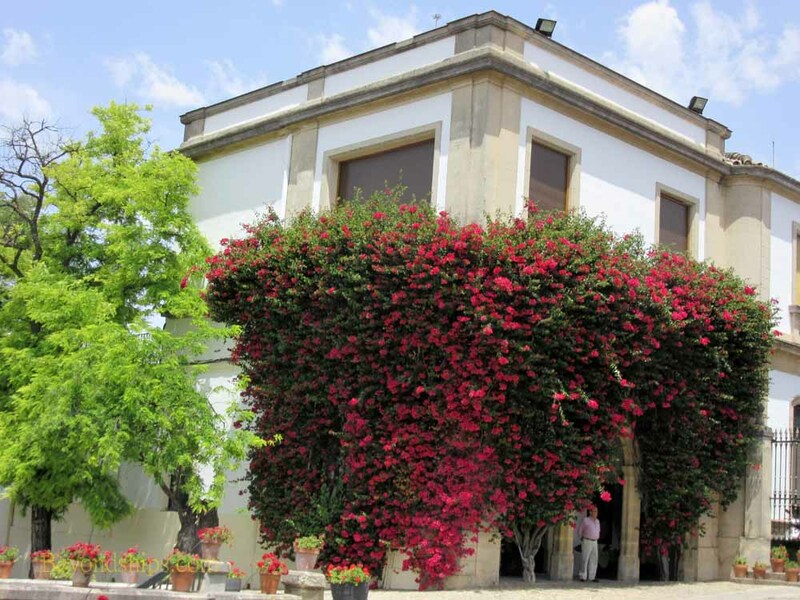 ​ Jerez de la Frontera is the sherry capital of the world. Indeed, the word sherry is believed to be a angelized coruption of the name Jerez. Uner European law, only sherry produced in the Province of Cadiz in the vicinity of Jerez can be called sherry. Sherry is a fortified wine. The base wine is typically made from the Palomino grape, which is grown in the area around Jerez. After fermentation, the base wine is fortified with grape spirits known as destilado. Among other things, this increases the alcohol content of the wine. There are several varities of sherry. It ranges from the pale, dry fino to dark sweet sherries, which are made by fermenting dried Pedro Ximénez or Moscatel grapes. Cream sherries are a blend of different sherries. Wine has been produced in the Jerez area going back to ancient times. However, sherry did not become popular outside the region until Sir Francis Drake riaded Cadiz in 1587. Part of the plunder he brought back with him to England was 2,900 barrels of sherry. It took hold in Britain and the fame of grew along with the British Empire. Reflecting the popularity of this wine in Britain is the fact that several of the large sherry houses in Jerez have British names. When I was studying at Cambridge University, one of the teaching fellows invited all of the Americans in the college to his rooms for a sherry party. In America, sherry had the image of being a drink favored by Victorian old ladies and so there was some skepticism about this invitation among the guests. It quickly became apparent, however, that sherry was not a dainty drink. It ranges from 15 to 22 percent alcohol. Great aunt Tilly must have gotten quite pickled sipping her sherry. 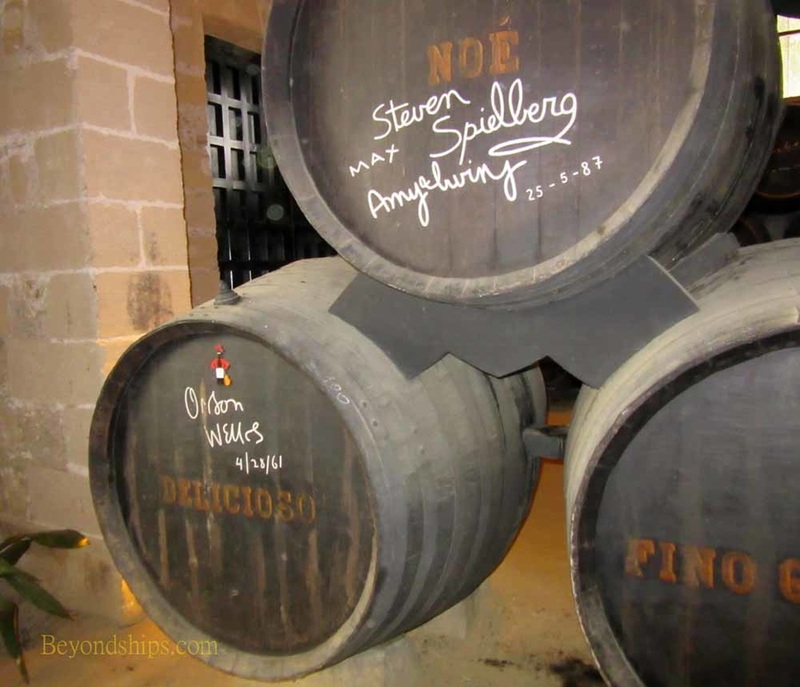 There are some 30 producers of sherry in the Jerez area and several of them offer tastings to visitors to their bodegas. On this tour, we visited those of the giant Gonzalez Byass, makers of Tio Pepe. The bodega covers a considerable area in the city. 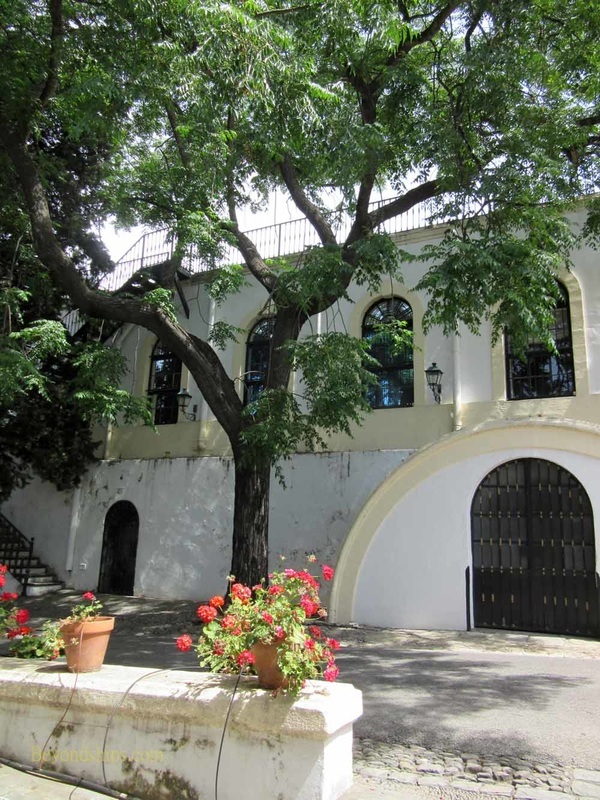 It consisted of low lying, Spanish style buildings, often surrounded by flowering plants. As a result, the grounds have a pleasant Mediterranean feel. 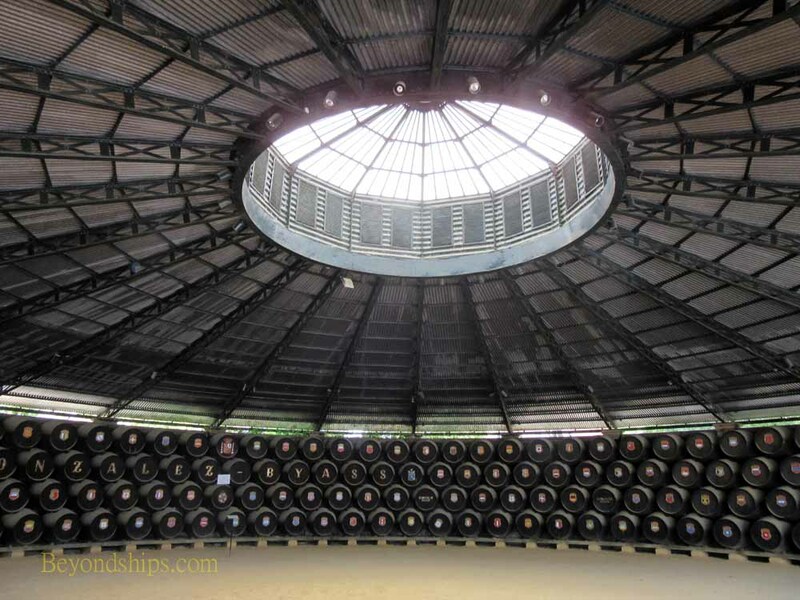 For the most part, the buildings are used to store the barrels in which the sherry is aged - - the grapes are grown and the wine is made at other facilities. While it is impressive to see so many rows of barrels, the barrels have a limited appeal. Most of barrels are just black-colored wood. However, a number of them have been autographed by famous people who have visited the bodega. I saw one signed by Picasso. 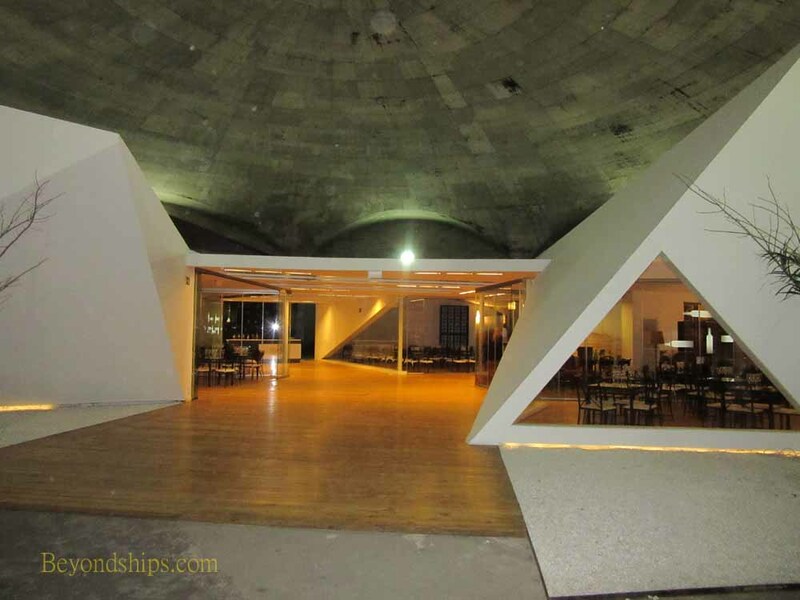 After touring the storage rooms, we were taken to a large modern facility that is used as the tasting room. Each of the visitors was given three varities of sherry to sample. Not enough to become an expert in sherry, but enough to give the experience a gentle glow. ​Above and below: The buildings of the bodega are surrounded by flowering plants and shade trees.